Gigantic, venomous serpent spanning two fingers to sink its teeth into the third. 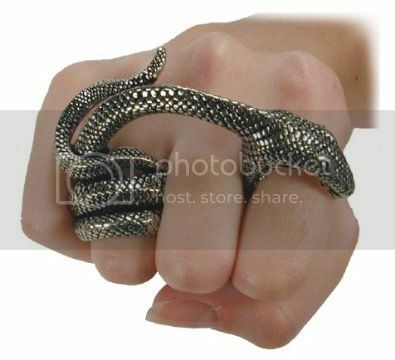 Generally worn on the ring finger, with the snake biting the forefinger. This massive Alchemy Gothic pewter ring cannot be ignored! 3" across, 1 1/2" wide.